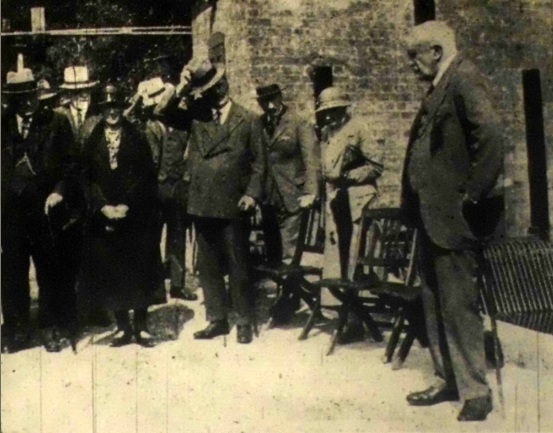 When Guthrie Allsebrook bought Arborfield Hall in 1926, he was in the right place at the right time, because Wokingham Rural District Council had long grappled with the problem of supplying water to its central area. Guthrie Allsebrook's business was water supply. New Pumping Station opened at Arborfield. A Copious Supply “of Excellent Quality”. The culmination of years of work on the part of the Wokingham Rural District Council was marked on Wednesday, when the chairman (Mr. E. M. Sturges) formally opened the Arborfield Mill Pumping Station . The water supply for the central part of the Council's district has been a matter of considerable trouble, but it is hoped that now all that trouble is over. The water, which has been described by an analyst as “typical well water of excellent quality”, is obtained from a borehole 340 feet deep. During a fourteen days' test the yield was never less than a quarter-of-a-million gallons a day, and the reservoir which has been erected will hold twice this quantity, so that there is no danger of a shortage. The residents of the district are now assured of a pure and copious water supply and the present works are of such a nature as to need little adjustment to meet any new local demand. QUARTER OF A MILLION GALLONS A DAY. The pumping station is housed in what was at one time a grist mill on land belonging to Arborfield Hall, the residence of Mr. and Mrs. G. Allsebrook. [Photo caption:] Mr. E. M. Sturges performing the opening ceremony at the new pumping station at Arborfield Mill, which is to supply the Wokingham R.D.C. Area. [Photo caption:] Watching the water brought to the surface - “Reading Mercury” photographs. The following chairmen of parish councils: The Rev. J. A. and Mrs. Anderson, Mr. J. A. Simonds, Mr. and Mrs. F. C. Bullingham, Mr. and Mrs. E. Capon, Mr. and Mrs. L. Treacher, and the Rev. S. and Mrs. Winter. Others who accepted were: Mr. Sydney and Mrs. Brain, Mr. and Mrs. J. A. Brain, Col. Pearson, Mr. Catley, Mr. J. S. Alford, Mr. W. C. Tyndale, Mr. Rhys E. Evans, Dr. J. J. Peterson, Mr. W. G. Alexander, Mrs. E. A. Hoskins, Mr. and Mrs. L. L. Longhurst, Mr. and Mrs. C. H. Baylis, Mr. and Mrs. G. Heath, Mrs. E. W. Nixon, Mr. F. S. Benton, Mr. G. R. Tween, Mr. C. W. Phipps, Mr. S. Hodgkin, Rev. A. P. Seymour. Also present were Mr. and Mrs. G. Allsebrook, Miss Allsebrook and Mr. Colin Allsebrook. Mr. Sturges, before opening the station, said he spent many hours of his life at the work. He was very pleased to see there that day Mr. Treacher, who knows more about the inside of the earth than any other man in England. He was sorry Mr. George Ford (the vice-chairman of the R.D.C.) was unable to be present. Mr. Fitzwarren Smith had also gone to a great deal of trouble to help them in every possible way, and they regretted his absence. 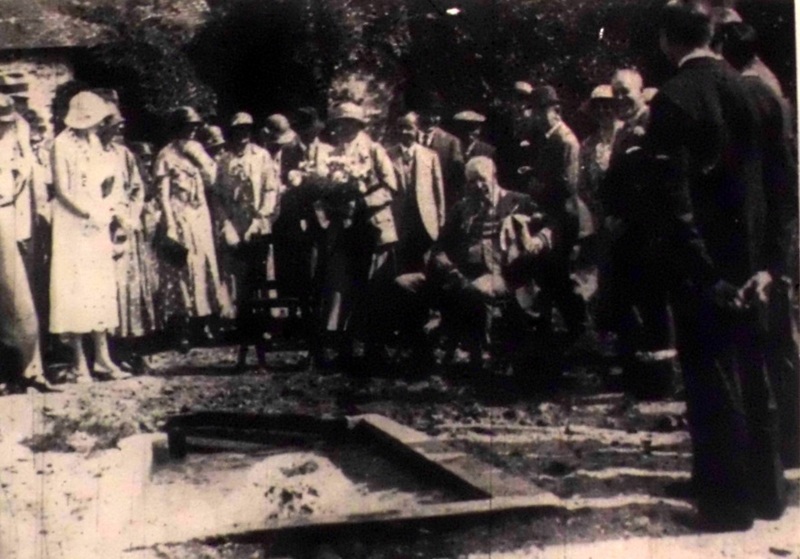 Mr. Sturges paid a tribute to the work done by the clerk of the Council, Mr. P. H. Phipps . 38 YEARS OF PUBLIC SERVICE. Mr. Sturges recalled that he was elected to the Council thirty-eight years ago, and after he had been a member for about five months, he was made vice-chairman. He held that office for eight years, and for thirty years he had been chairman. They had had a great deal of trouble and many trials. The water scheme had been a great trouble. Eventually, after other schemes had been considered, they came to terms with Mr. Allsebrook. All he could say about it was that it would be a great blessing in their neighbourhood. They must not be angry, however, if at first the water was a little discoloured, because it would be passing through new pipes. Mr. Sturges then proceeded inside the station and severed a ribbon tied to the valves. After this he was presented with a well-bucket as a memento of the occasion, and Mrs. Sturges was presented with a bouquet by Miss Allsebrook. Mr. J. S. Alford , M. Inst. C.E., the engineer, spoke and said the water supply of the central part of the rural district had been a troublesome matter for many years, but that day the troubles might be regarded as over. The works are laid out so as to distribute 250,000 gallons a day, which is considered more than the demand is likely to be for many years to come”, he said. 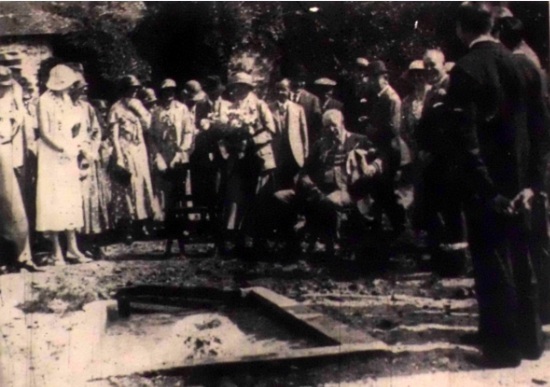 “When the borehole was put down it was tested by 14 days' continuous pumping, and during that time it never yielded less than 250,000 gallons a day. Tests of this character are carried out for two reasons. First, to ascertain whether the yield is reliable, and secondly, to enable a sample to be taken after a prolonged period of pumping, at which time if there are any impurities in the ground from which the water comes they are likely to be drawn into the borehole. A sample was taken, and the chemist who analysed it described it as a 'typical well water of excellent quality'. This water, which is the result of rainfall on the Hampshire Downs, has before reaching the borehole passed through miles of chalk and may be regarded as safe against impurity as any water possibly can be. None of the water which falls on the area supplied is allowed to get into the borehole. Such water is excluded by means of a steel lining which has been carried to 224 feet below the surface. The top of the chalk is about 200 feet below the surface at this place. The borehole is 340 feet deep altogether. 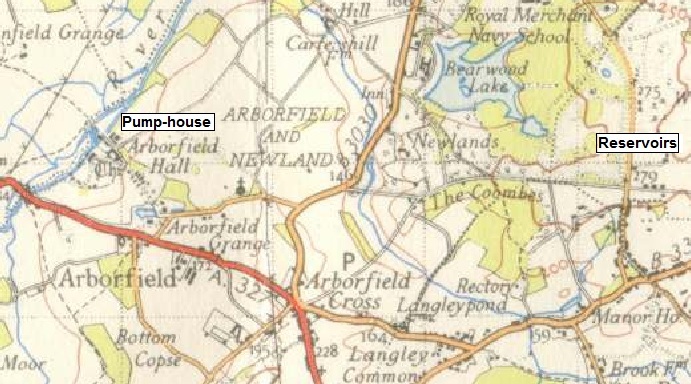 “What may be described as the backbone of the scheme consists in a main laid from Arborfield Mill, through Arborfield Cross and Barkham, to the new service reservoir on Bear Wood. This reservoir will hold 500,000 gallons and is in three parts, of which only one part is needed at present. From the reservoir the supply main continues through Sindlesham to Winnersh cross-roads and thence to Loddon Bridge . These mains are 10in., 9in., and 8in. in diameter. From this backbone, branches of smaller diameter have been laid to the more populous areas. The total length of mains laid is about 25 miles. Of this the backbone represents about 6¼ miles. “The cost of the scheme has been about £50,000. There is still some work to do, chiefly in the parish of Earley . The cost of it depends on the result of negotiations not completed. The ultimate cost of the scheme will exceed £50,000, but not by any large amount. “If”, he continued, “at some future time the demand should exceed 250,000 gallons a day, or if a new heavy local demand should arise where it is not expected, the adjustments and new works necessary to increase the quantity would not be serious. There will be no difficulty in constructing a high level tank at Bear Wood to work in conjunction with the reservoir recently constructed, so giving a greater head during the hours when the demand is greatest and consequently when the pressure is lowest. For this purpose the additional height to which it will be necessary to pump the water could be arranged without difficulty. “In laying out the scheme we have been governed throughout by the consideration that for many years to come the revenue from water rents cannot meet the loan charged, and that the difference will necessitate a rate in aid. To keep down the rate as low as possible the capital cost must be as small as is consistent with providing a suitable and sufficient supply. This object has been kept in view throughout. The council have been able to carry out the scheme at a time of low prices and when substantial help could be obtained by a grant from the Unemployment Grants Committee. It would, therefore, appear that the delay which occurred in launching the scheme has not been without its advantages. Concluding, he took the opportunity of congratulating Mr. Sturges on the completion of the scheme, on which, during his long term as chairman of the council, he has spent so much thought and time. 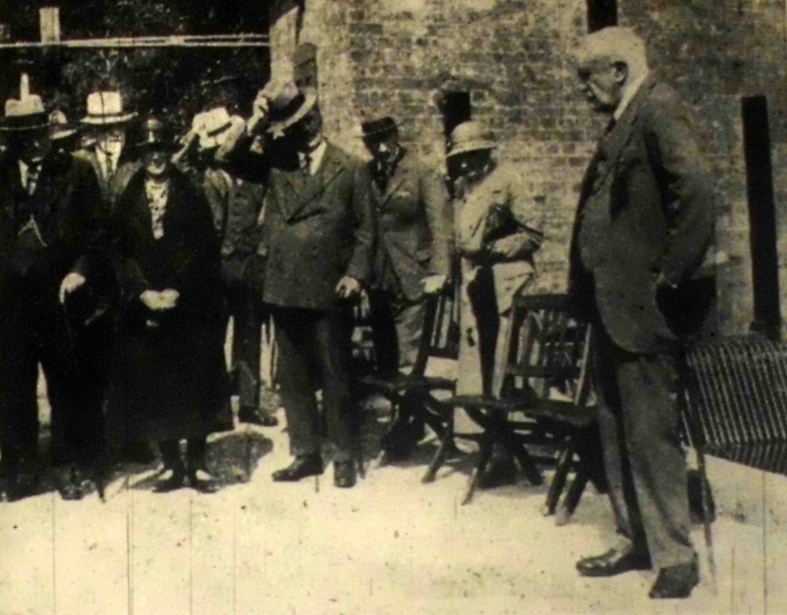 He also spoke highly of the work of the contractors, Messrs. George Riley and Co., and Messrs. Collier and Catley. Mr. Allsebrook was thanked for his services, and Dr. Paterson also spoke. He said he regarded it as a great day, because he looked on a pure, wholesome and copious water supply as the foundation stone of the structure of public health. Mr. Allsebrook mentioned the geological features affecting the scheme, and said that there were only fourteen degrees of hardness in the water. 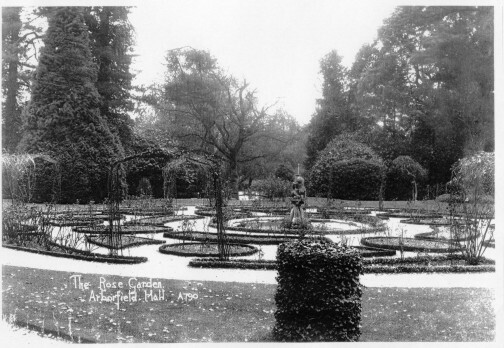 After the station had been inspected, tea was provided in the rose garden by Mr. and Mrs. Allsebrook. The stand-by pump was made by the Pulsometer Enginering Co., and the crude oil engine by Petters of Yeovil. The turbine was supplied by Boving, and the large ram pumps by Hayward, Tyler and Co. Considerable work below the surface and below river level was necessitated to instal this plant, and it was carried out by Messrs. Collier and Catley. WOKINGHAM RURAL AREA WATER SUPPLY. Wednesday was a proud day for Mr. E. M. Sturges, the chairman of the Wokingham Rural District Council, for it marked the formal opening of the Arborfield Mill Pumping Station in conjunction with the provision of a water supply for the central part of the Council's district. No-one has displayed greater enthusiasm for the scheme than Mr. Sturges, and it must be a matter of keen satisfaction to him that, considering the enormous difficulties which have been surmounted, it has at last been brought to fruition. Mr. Sturges has been associated with the council for 38 years, for 30 years of which he has been chairman, and it is particularly appropriate that he should have been asked to open the new pumping station. The scheme is an excellent one for the district, and it should do much for its development. The total length of main is about 25 miles, and the cost of the scheme has been about £50,000. In giving a description of the works, the engineer pointed out that the water supply of the central part of the rural district had been a troublesome matter for many years, but now the trouble might be described as over. What might be described as the backbone of the scheme, he said, consisted in a main laid down from Arborfield Mill through Arborfield Cross and Barkham to the new service reservoir at Bear Wood. From the reservoir the supply main continues through Sindlesham and Winnersh Cross Roads and thence to Loddon Bridge. One of the chief difficulties has been that for many years the revenue from water rents will be insufficient to meet the loan charges and that a rate in aid is inevitable. To keep down this rate as low as possible while securing a sufficient supply has given rise to anxious consideration. Everyone concerned in this important piece of public work may certainly be congratulated on its successful accomplishment.